Suzuki is very keen to stress that the new GSX-S1000 is very much a sporty naked bike. It’s nothing at all like a certain, SX-y, Z-list bike from Competitor ‘K’, the nice PR man tells me, on a regular basis. Oh no. Nope. This is all well and good – it’s their bike after all. And we’re mostly happy with this: the GSX-R-based engine, the strong brakes and nimble handling put the GSX-S up at the top of the sporty naked pile. On the other hand, if you’re going to put a big fairing on the front of a bike, in order to make it a bit better for distance work, surely you’d expect owners to want some luggage on there too? Sadly, the super-minimalist rear end of the GSX-S seems to rule out a decent-sized rack, and fitting a top box is a distant dream at the moment too. Living in London, as I do, I end up using the bike for plenty of utility trips. You have to down here – in the car, you’re at the mercy of the traffic, and a five mile trip can take all day. So, while I subscribe totally to the notion that bikes should be all killer and no filler, sometimes we have to compromise. I’ve always liked a topbox on a bike, to carry camera gear to jobs, or to stick the helmet and waterproofs in when heading to the airport. It keeps you narrow, for slicing through jams, it makes wheelies easier when loaded up, and the only downside, generally, is a gentle weave once you get the wrong side of 120mph-ish. Of course, you have to suffer the slings and arrows of jibes from your peers, who love to mock your box. This is best dealt with by an even more aggressive riding style I find. Anyway. The upshot is, I’ve been hunting for some luggage for the GSX-S. And my good chums at Motohaus have come up with the goods, in the shape of some Blaze semi-hard panniers. These are a neat halfway-house between plain throwover soft luggage and proper hard cases. 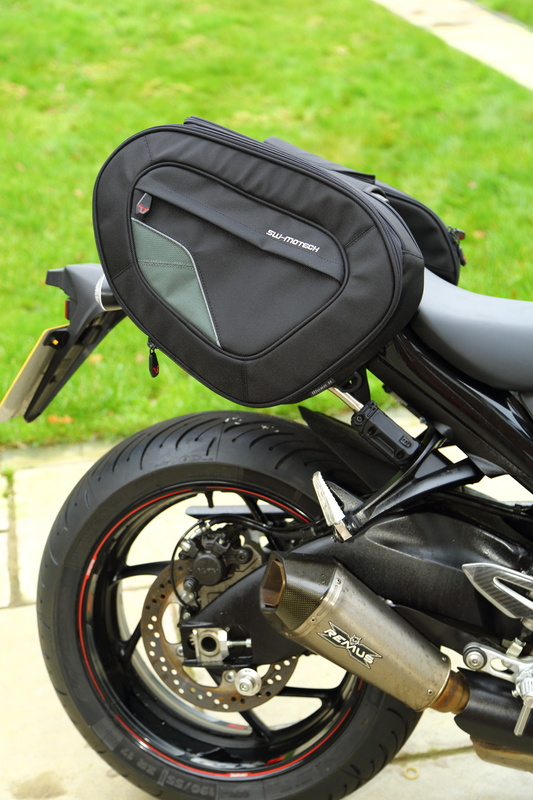 The fitting kit uses a pair of bolt-on support bars, which attach to the pillion peg brackets, and support the cases from the inside, fitting into pockets on the pannier backs. The bags themselves are a semi-rigid throwover design, with attachment straps that clip onto the support bars. They have double zips which can take a small padlock, have an external pocket, can be expanded, and have waterproof bags to go with them. They’ve not got the carrying capacity or the security of hard cases of course, but they’re much better than simple throwover bags. Fitting is a breeze. 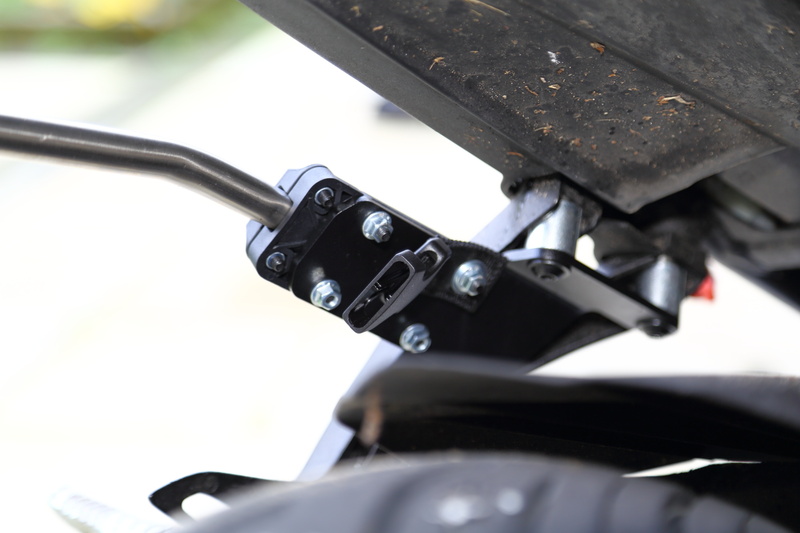 The support rails clip into holders, which attach at the pillion peg mounting bolts. Five minutes to assemble the brackets, then replace the stock bolts with the longer SW Motech bolts. Four bolts, and you’re done. Now, assemble the support bars, and clip them into the holders. Bosh. A leisurely 45 minutes and you’ll be set. Now, slip the panniers onto the support bars, velcro them over the pillion seat, clip the attachment straps into the buckles, and off you pop. 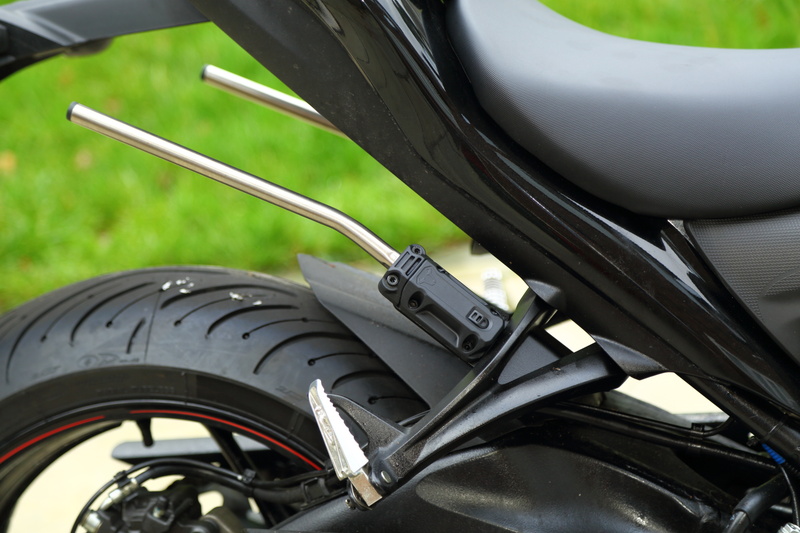 When you’re not using them, the pannier rails unclip in seconds, leaving your bike clear and uncluttered. Smart. Motohaus is the UK importer for SW Motech. 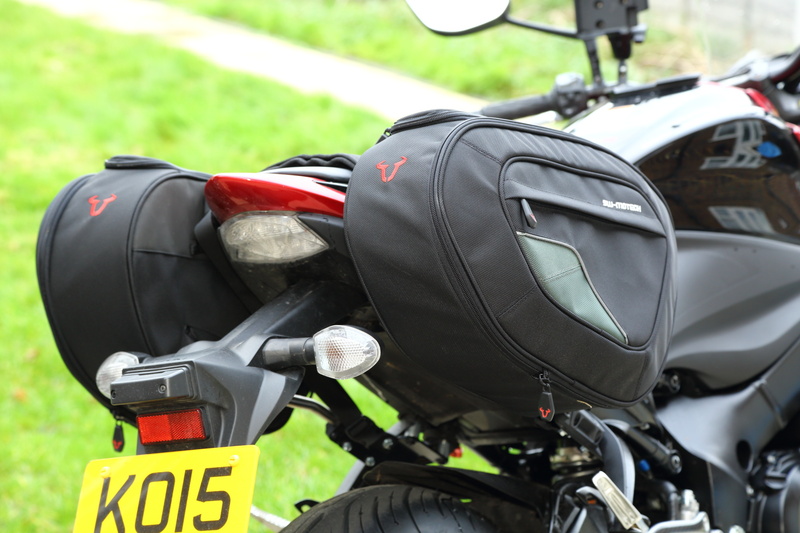 The Blaze panniers cost £190. More info at Motohaus, or direct at SW-Motech.